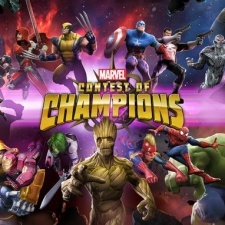 Kabam’s mobile fighter Marvel: Contest of Champions reached a massive $3.3 million in player spending this past Cyber Monday. That figure was reported by Sensor Tower and marks a 583 per cent revenue increase for the licensed brawler in the space of one week. It also hit 21 per cent higher than its previous record of $2.75 million back on July 4th. Contest of Champions hit No.1 among all mobile games in the US on Cyber Monday. Worldwide, it took No.2, second only to Tencent’s monolithic MOBA Honor of Kings. $2.8 million of this spending came from the game’s top market in the United States, making up 85 per cent of total revenue. Week-over-week growth from the preceding Monday in the region increased 767 per cent. Following Black Friday, Cyber Monday is a similar event that sees large discounts applied to digital goods across stores worldwide - without the pretence of needing to empty out warehouses. Which Marvel games are beating up the US top grossing charts?